We work long-term with closely-held businesses and with professional and high-net-worth individuals and families. We bill by the hour at rates from $125 to $260 (rounded to 15-minute increments). Our team can assist with nearly any aspect of taxation, accounting or financial planning. Startup consulting -- There are hundreds of considerations when embarking on a new business venture. We can help you choose which type of legal entity will meet your needs, analyze your financial assumptions, identify potential cost savings and help you maximize profitable lines of business. Tax planning and preparation -- Tax requirements are constantly changing. You can depend on us to understand those changes so you don't have to worry about them. We can help you plan ahead to reduce your tax liability and take care of the paperwork. You can spend your mental energy making your business succeed. Financial consulting -- Business owners, naturally focused on the details of their enterprise, often find our financial second opinion useful. Because we work with scores of businesses, we can help you spot financial trouble signs and opportunities in your business you might not notice. We can even serve as interim controller or help you recruit staff members to meet your financial needs. Financial statement compilations and reviews -- Bankers often want verification of a business' finances. Our objective compilation or review of your financial statements often satisfies this need, saving you the aggravation and expense of an audit. Accounting systems consulting -- Bookkeeping can be a headache for overworked business owners, but we can make things simple by helping you replace the shoebox or pile method with a well chosen computer accounting system. We can set up QuickBooks and most other popular programs and train you and your staff to use them. This lowers the cost of our services over the long-term, because your financial data will arrive orgainzed and ready for us to analyze. Software also gives you real-time information to inform daily business decisions. Divorce financial planning and advice -- Attorneys represent your legal interests in a divorce. We can work with your attorney, offering clear-headed advice on the financial implications of various settlement options. During the emotion of a divorce, clients often find comfort in knowing their settlement is a fair one. President Heather Smith Linton is nationally prominent in this specialty as author of The Complete Guide to Protecting Your Financial Security When Getting a Divorce. Tax planning and preparation -- Some try to file their own taxes or depend on low-level tax preparers even when such factors as investments, self-employment income and rental property have made their finances quite complex. Hiring us as your accountants is wiser. We often discover errors or omissions on new clients' prior tax returns that cover our fee several times over. 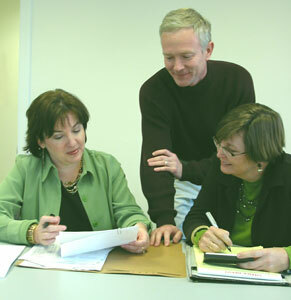 When you work with us, you'll have peace of mind knowing that your taxes were prepared by an experienced CPA. Objective financial guidance -- We all work to save for retirement and for children's college education and to optimize our debt, among many other considerations. But often those who dispense financial advice stand to profit by persuading you to buy certain investments. We don't sell financial products, so you can be certain we're offering advice in your best interest -- and that we understand how each decision fits into your overall financial situation. IRS representation -- If the Internal Revenue Service audits your return, you need to be represented by professionals. We understand how to present your case, explain the potential outcomes to you and negotiate the best one possible.